The best red in a glass of its own. From a company known for their exquisite glassware and a winery and region known for complex and interesting reds, comes this combination. 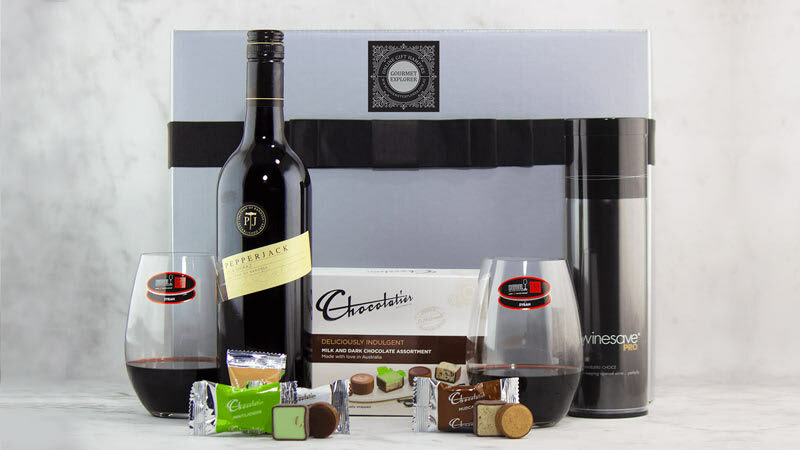 This elegant gift hamper is as tasty as it is tasteful - featuring two beautiful Riedel "O" Series stemless glasses and a bottle of Shiraz to enjoy in them! This hamper is the perfect gift for lovers of wine and the finer things in life! Make someone's day with this wonderful hamper delivered right to their door. Winesave - A simple and effective way of preserving the life of your opened bottle of wine. Presented in a gift box lined with black satin tissue and tied with ribbons. Your own personal gift message printed on a lovely Gourmet Explorer Gift card.